Nice Design, which is different to the usually seen spinner, so i like it. But there is one thing you might consider: Your upper Wheel mounting looks fragile. So i suggest to support the wheel on both side or to use a really solid axle. For example, i use a toolsteel axle with nearly 12mm Ø, which is supported on both ends in my feather. The second point, it seems you have a slotted hole for the upper tire axle, what is the function? It is good to use a lot screws, but don`t you think the wall thickness between the srew holes is at certain points a little bit to thin? Yeah mounting on both sides would be stronger. The slot serves two purposes. One is to adjust the pressure between the upper wheel and the main wheel. The other is that when the upper wheel is under pressure, it will have a tendency to press up against the main wheel so it will have even more contact. Also, a part of the upper wheel's load is actually taken by the main wheel. 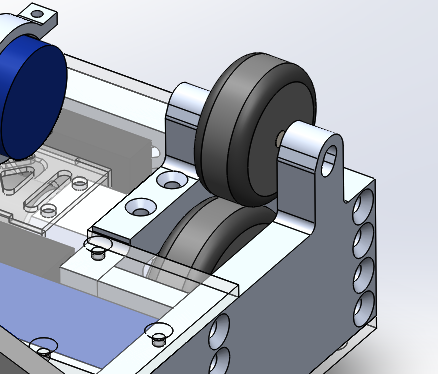 The big amount of screws are actually there to compensate the lack of connecting lugs in the chassis (my early designs actually had lugs, but the machinist said those would be hard to manufacture even with rounded corners.). 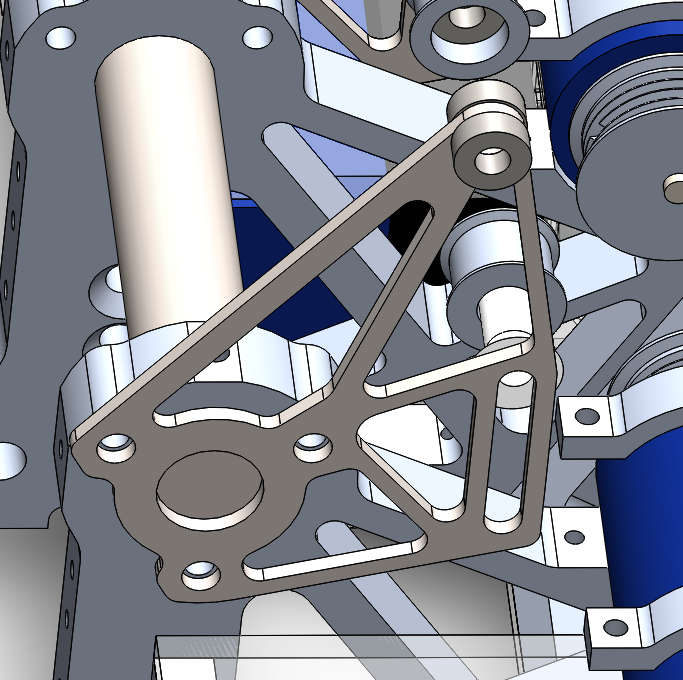 The actual strength of the parts is something I still haven't tested or simulated. 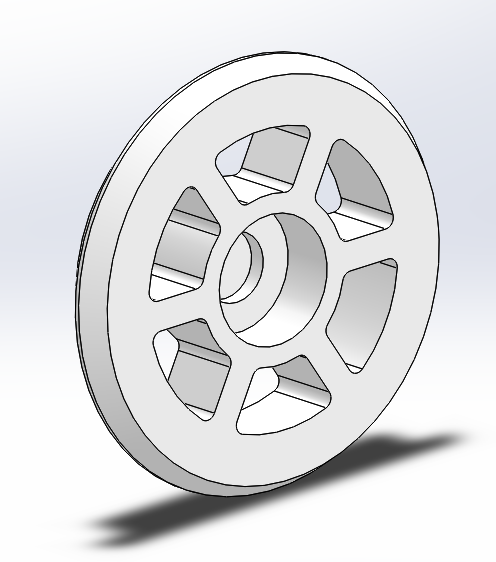 Backup plan is to either switch to fewer bigger (probably m8) bolts or to add lugs to the design. 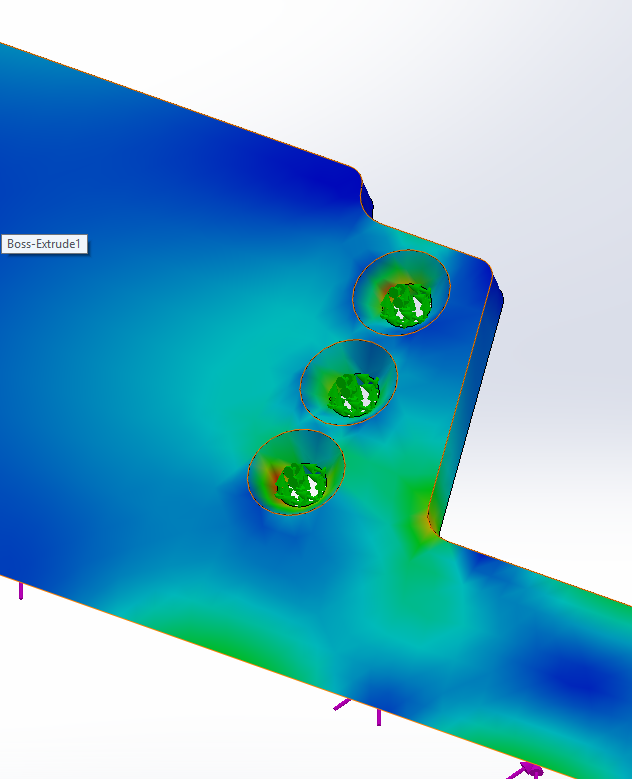 Ran a few simulations in SW. For all the aluminum pieces the bolt holes didn't seem to be a problem maybe because of the pocketing in the plates weakening the rest of the plate down. However it's a bit different for the steel parts (wedges), which have no pocketing. Now I have an F1 front spoiler. Well the forces which actualy lead to tensile forces on the screws are mostly not the biggest challenge. In your case the walls arround the screws are thin an if you simulate lateral forces, there will be a complete different result. Sorry not so sure what you meant by lateral forces... Did you mean these? 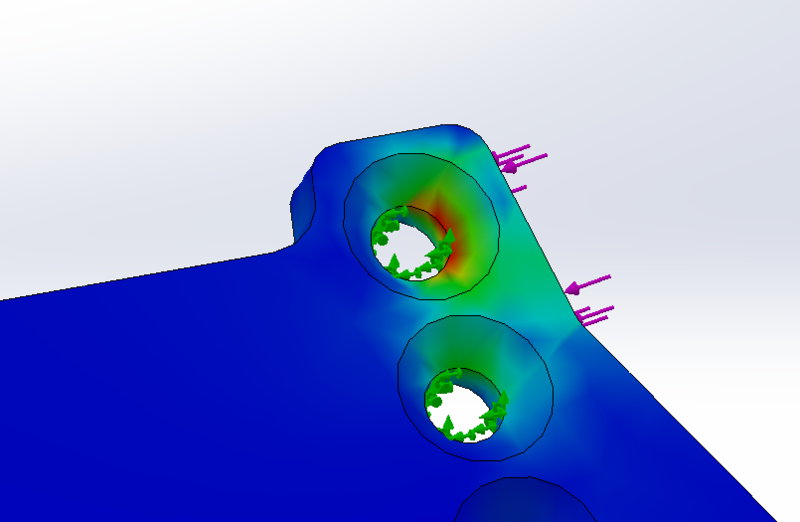 In these cases the screw holes do seem to have very high stress concentration. I then experimented with fewer, larger screw holes, but that created even higher stresses. Well it`s not easy to communicate about such things only with writing, but i think you made it. Your first simulation looks pretty close to what i was thinking about. 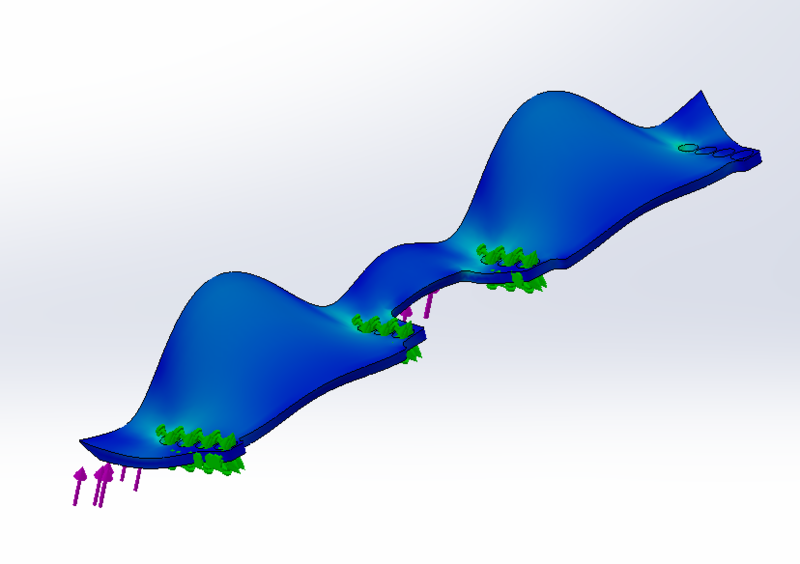 Can you simulate the forces ont the small top surface instead of the front wedge? With deformed result off the red is a bit concerning even at 1000N. How do you reckon can this stress concentration be reliefed? 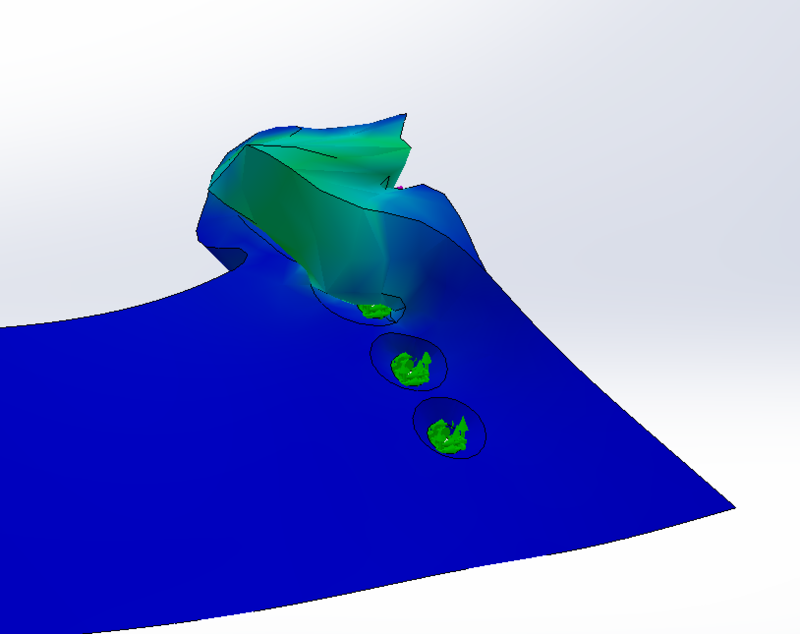 The most important thing about FEM-Simulation is, it only works if you stay under the yield strenght from the used material. 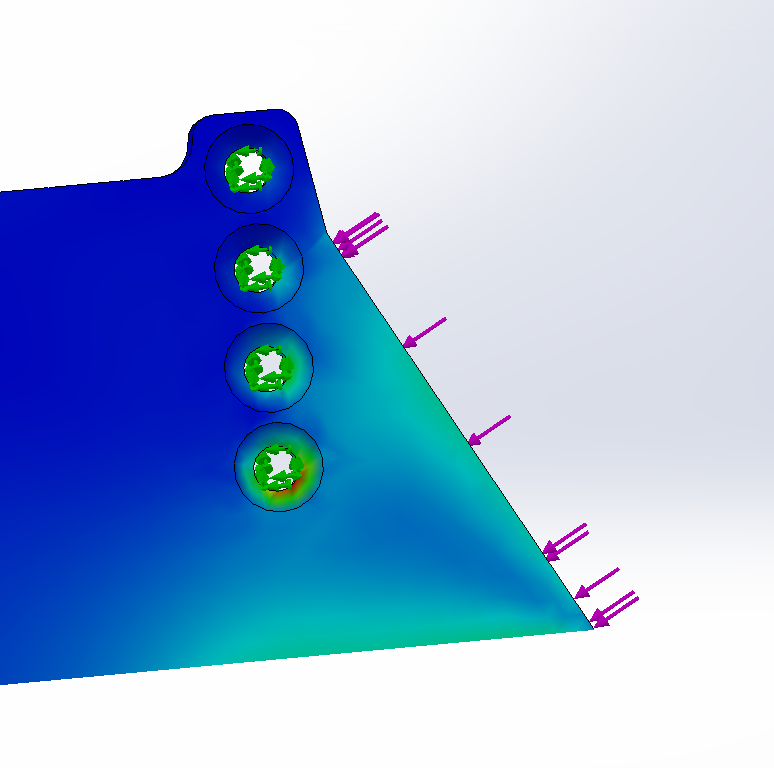 It is also Important to select a appropriate mesh size, due the fact it will affect your simulation. And of corse the forces and the fix point has to be set accurately. To answer your question, i would use the countersunk area only. In the previous version of Abomination I left an error in the design. One of the threaded holes for motor mounting was just next to a near vertical feature, making it impossible to actually drill or tap that hole. The makeshift solution is to make the top half of the weapon mount a separate part so that there's nothing protruding where the mounting hole is. However this does bring new problems: keeping the weight more or less constant I only have 3mm Ti for the top half. Moved the weapon motors way back. Now my weapon won't hit my own weapon motors. Yay! 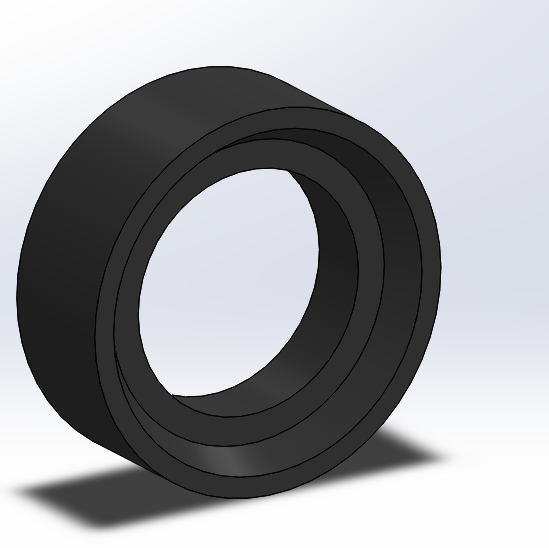 Designed a new inverted wheel. 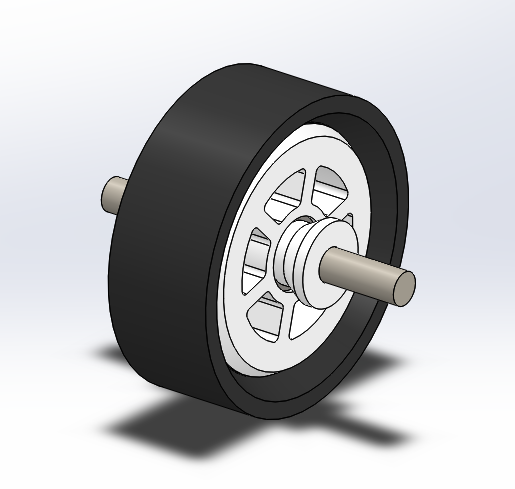 The caster wheels I'm currently using are too wide and heavy. The new wheel is also slightly larger at 5.5cm. It has been a busy and somewhat unfortunate week for my robot. The way I mounted the weapon motors onto Contraption prevented me from using the right sized belt. 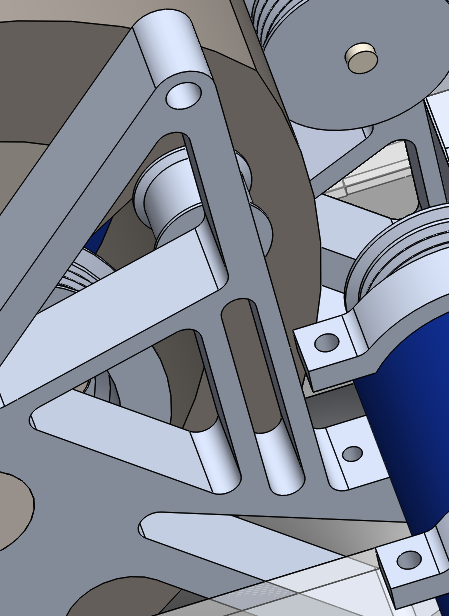 Currently the motor goes straight into the hole in the weapon mount, and the ribs of the belts just won't clear the pulley. I tried a longer belt with some 3D printed tensioning idlers with ball bearings in the middle but those exploded under high speeds. Going into this year's Nationals I don't think I will have a weapon unless some miracle happens. Lessons were learned about how poly-V belts behave (when they don't work) and hopefully Abomination would be a better bot. Big thanks to team Rotwang who gave me some belts so that I don't have to be a wedge... at least for now lol. And thanks to everyone who lent me their tools and offered help I had an awesome day. Since tomorrow is a filming session and I won't be writing the report for tomorrow any time soon, I figure it's better to just write down things that happened during the day when memory still serves. Also it would be interesting to see after the fact how my memory of the fights line up with the actual footage. I started today off with a basically complete robot just missing the battery, which I forgot to bring yesterday. I started the safety check as early as I could, and things went down from there. During spin up one of the belts snapped off at about half speed. This was probably caused by me previously testing the weapon with a bunch of washers as tensioners, which burnt through rubber and damaged the belt's fibers. My pit neighbor Rotwang was super nice and lent me some belts. I was lucky that my first fight was kinda late into the morning session, so I had enough time to do a complete strip down and reassembly. I was running one of my own belts (this one was used in earlier testings, and it was really torn up even before this, but it did not have the fiber damage) and Rotwang's belt. At the start of the fight I spun the weapon up with full throttle. I still have to check this after the videos come out but I think both belts snapped during the spinup. From the sound of it I didn't think it was quite at full speed but man was the weapon a complete overkill. The first hit onto stingray was massive and the weapon had enough momentum to deliver a few more hits before eventually coming to a halt. From then on it became a wedge vs horizontal spinner/saw fight. Stingray's weapon got a chunk of my weapon mount, hit my weapon at multiple places, and almost managed to kill one of the weapon motors (not that it would make a huge difference tho cuz I already killed my own weapon at that point). During that process, I also noticed that my bot was not driving entirely straight, a problem that would come back again and again. In the end I won by a very close JD. Going into the second fight I knew I had to take the whole thing apart again (ugh) to give it new belts, which I don't have any. All I had left was the belt that had some fiber damage but survived the safety test (cuz its college died before it) plus a part of Rotwang's belt (their belt was too wide so they cut two of the ribs off, which became this). To ensure that the belts won't snap I came up with the ingenious idea of wrapping both belts in electrical tape (oh boy did it backfire). During the tear down I also noticed that my drive motors are a bit loose (and at the time I falsely attributed the drive issue to that) and found out that I forgot to put the sping washers for the motor mounting screws. I started the second fight with a bit of wedge action. The previously mentioned drive issue and the narrow wheelbase made Contraption annoying to drive in a driving match. At some point I had this brilliant realization that I wasn't just a wedge and I had a weapon which I just spent two hours to repair. And the first thing that happened during the spinup was the tapes just came right off at like 2rpm. Assuming the tapes stayed where they first pop out, on one side the tape was completely off and on the other the tape got stuck in between the pulley and the belt, basically stopping that side of the weapon drive. At some point of the fight I hit one of the floor seams and managed to flip myself upside down using just my forward momentum (srsly wtf). I started driving upside down with my inverted wheels while trying to get the weapon up. The weapon only managed to hit the wall, sadly. At some point I completely lost drive on my inverted wheel (yes the other one came off a bit earlier) but Reboot 3 was kind enough to ram me back over to right side up. With the fight entering its last few seconds I attempted to restart the weapon, which resulted in one of the ESCs (the one on the side with the working belt) to catch fire and start smoking. But it's kinda funny how usually smoke is white but my ESC released some red smoke (meybe in the future I will be able to tell what blew up by the color of smoke jk). The red smoke might have been from the red anodized (?) heat sink but I could be very wrong. After the last (second) fight of the first day I attempted to rebuild my weapon (at least partially) from the belts from the second fight, a spare ESC, and a spare ESC that got damaged from storage during Contraption's eight month break before this event. Hopefully it will at least deliver one big hit in my fight against [NDA] (I dont even know who I'm gonna fight at this point). Needle roller bearings!!! these actually work!!! after some pretty big hits on Stingray and the arena wall (sorry Steve) they actually turn just fine. Hollow drum weapon: I thought it was pretty hard but stingray still managed to do quite a bit of damage to it. But it certainly had a lot of momentum and dished out big hits. I think it was a bit of an overkill especially considering how much gyro effect it had. 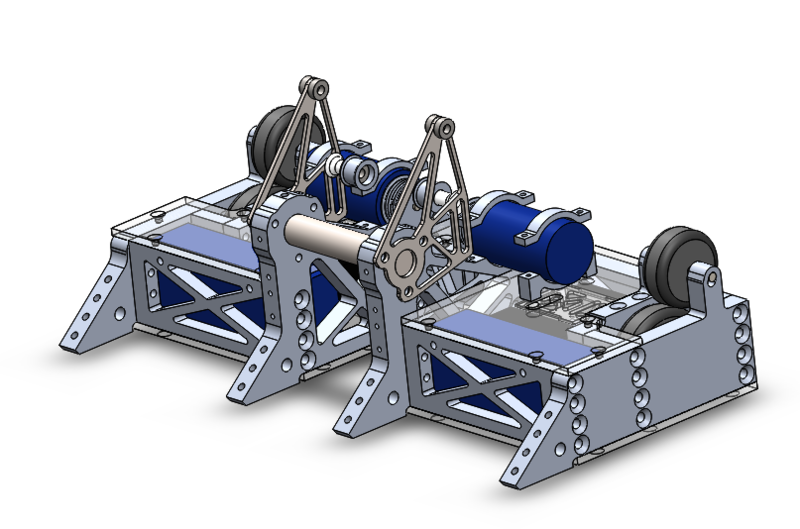 The chassis: it held up just fine, but there are still quite a few problems with it. The weapon mounts are somewhat exposed and prone to getting hit by a horizontal spinner. The assembly/disassembly process takes way too long. For this event this is fine since I wont go very far but in the future I need a simpler and more serviceable chassis for quicker turn around times. Banebots 60 Shore A (black) wheels: these do not wear out in like half a fight like the softer blue ones, but they still wear quite a lot and do not provide a whole lot of traction. I was getting outpushed by Reboot 3 consistently. Inrunner weapon motors: powerful but lacking in terms of low end torque, also draws a ton of amps and goes real hot. Inverted wheels: they worked fine until the nuts loosened and they just went off on their own. Gotta find a new way to do this but the overall concept of it is fine IMO. Belt tensioner in a slot right next to the weapon motor: no, just no. Dual motor weapons: cool af and powerful af, but PITA to get right and less reliable. If one motor fails then the other one has a pretty big chance to blow cuz it would be working over its rated load. But I might just keep these cuz how powerful they can be. Abomination has a lot of elements that I want, so I would prob work from there. unfortunately it also has some of the same problems as Contraption such as taking way too long to assemble/disassemble. I may also revise the structure a bit to allow for easy access to critical components. 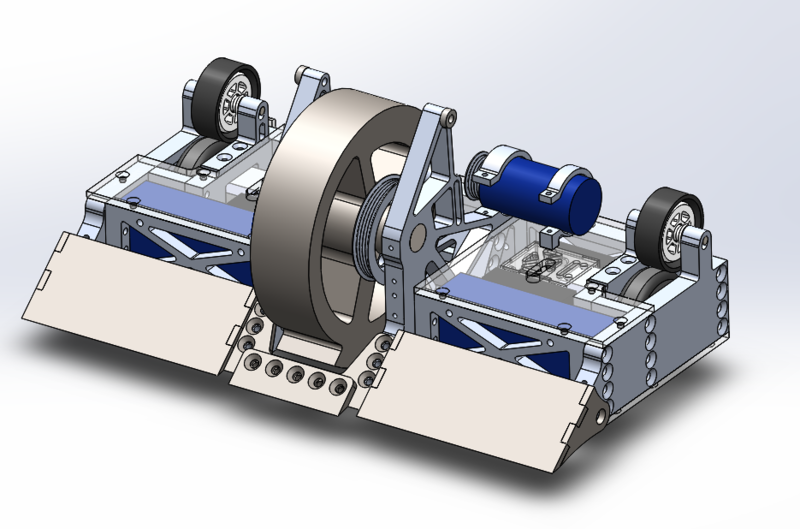 Right now on Contraption to get to the weapon motors and belts I have to do a complete strip down.